My friend Freeman Fly recently did an interview where he stated clearly that he believes there is a satanic conspiracy against ‘us’, the men and women of Earth. For those not familiar with him & if you can spare the time, please listen to this fascinating interview. It is something that I too have conisdered for a long time and now decide to state plainly just what this means to me and what I feel must be done. There is a reason why the majority of us are completely dissatisfied with the state of the world. That reason is simple: our planet is being destroyed by our own actions. Our model of living is backwards. Energy systems limit our energy, monetary systems leave us bankrupt, leaders bring us only war, and death, and lies. This disatisfaction we feel is known as a natural, heart-felt reaction to a problem we see plainly before us. The desire to respond to that feeling is again natural. The action of responding is not a single event, but your entire life, or until you no longer feel it necessary. The nature of response is talking your truth and doing the maximal amount of good for you, your family and all others. The goal of all our problems being solved is not an optimistic one, it is the best one. Why would you want any other? Taking the above points and using them to characterise a man’s principals and his subsequent journey in life would give you a ‘Jesus’ like character. We have found one half of the required characters to initiate our biblical scenario. Properly understood, what these points above mean is that when people speak of ‘christ consciousness’ or other such phrases, they are really describing a principle of character. Anyone imbued with such character would also naturally have a profound and meaningful life, because one could not attain such character without living in such a way as to create it. Reputations and celebrity may be cheap now but they are still earned, and without the babble of mainstream media thousands of years ago, rarer and harder earned still. Further, it is true to say that a man may attain a certain following with his words alone; but words alone rarely bring you meaning; only actions bring real meaning. The actions I speak of are simply being who you are meant to be and not ever straying from a natural, soulful and truthful way of life. As I’ve said before, it doesn’t take long before living according to the guidance of your heart – not your mind – will bring you ino conflict with the controlling interests of humanity. Everyone is born with the principles above. But everyone is also born capable of forgetting, ignoring and distracting themselves from them. More importantly still is that everyone is capable of being fearful of what may happen should they decide to act. Throughout your life, just as throughout mine, we are offered opportunities to grow and learn about ourselves. It is natural that we would want to go ‘out there’ and solve the problems of the world, but in reality what are you truly capable of solving? Could you really walk into court and show them who’s boss with the information on this and other websites? As most will tell you, no, it is not possible. Rightly or wrongly, despite facts and evidence pointing to our true status of soul-incarnate, and being alien and superior to corporate courts, the lawful rebel is still steamrolled in the vast majority of cases. Was he right to rebel? Absolutely. Was his standing based on evidence? Of course. Was he ignored in court? I’m sure enough of you reading this know the answer. Yet court is where most people will still go – directly against the alleged authorities and the corporate contractual law system, which is specifcially designed to ‘soak up’ the lawful rebels’ energy, time and money. It is a tough thing to admit, but for most it is advisable that you do not engage the legal beast unless you absolutely have to. The reason for that is simple. The problem is not ‘out there’. If we are honest with ourselves, we are very flawed individuals yet perhaps this is how we are meant to be. A path of spiritual development is derided enough within society, and mainstream religion has so much blood on it’s hands you’d need a boat just to get to congregation should it’s bloody past be spilled today. Yet most would agree that there is a faint calling persistant throughout life which beckons you to discover it’s source. What it may be for others beyond a very faint yearning I am not sure, but I feel it as a desire held deep within for peace on Earth. In order for our current chaotic rulers to be thoroughly exposed and ejected from power, we must first become aware of their presence. That won’t happen unless you are talking to others. It is often said that you cannot change others. I would have to agree; we all know that people can only change themselves. So, plant that seed gently! All that we can truly do is offer inspiration to others so that they might be inspired to change themselves. In order to offer that inspiration we must all realise that this comes from changing yourself; being more polite, positive and compassionate. If you can walk this line, you are afforded a unique sort of protection, and people will come back to you and ask more questions. Alex Jones is loved by some but he does have a knack of repulsing the still-slumbering, still-doing-ok-enough-not-to-notice, a.k.a the middle class. Following Sam’s conversation at the end of the video, I wouldn’t be surprised if Sam hadn’t heard of Rob Menard or John Harris, Dean Clifford and so on. To return to the topic, Freeman Flys’ recent statment of belief in a satanic conspiracy now may be a little easier to understand; Satan, the great adversary, is here to thwart the reign of christianity and the story of Jesus. Taken in context we see that this applies broadly against the consiciousness of man; the actions of the whole of the negative, opressive factions within the various institutions constitute the satanic machinery. Satanists work the machinery operating the levers of power in order to serve Satan. It is mocking, ridiculing, deceiving, tempting, violating and desecrating the natural structures of man and woman, and the world in which they live. It is protection of criminals, murderers and war mongers, it is the perversion of justice, but more accurately it is a product of putting self interests above all else. Do as thou wilt shall be the whole of the law. The control system will flourish for the desires of the corrupt, and the inaction of good people. As time ticks on in the global struggle, most people will stand on one side or the other; supporting or thwarting the control system. This is now resulting in systems independant of it’s clutches like Bitcoin, which has caused huge problems for other currencies, and StartPage, which doesn’t spy on internet searchers. The people will empower these systems just by using them. In this way the sides are slowly drawn, and soon the divisions will be made very clear. There *** is *** such a thing as good and evil. Never listen to those that say otherwise. To say that mass genocide is an excusable act from a particular point of view is obscene and false logic. Therefore to say there is no such thing as good and evil is untrue. There is no excuse for malicious intent towards others, and that’s exactly the satanic practice. So if you’re joining this fight it had better be for the right reasons and you had better be prepared. There are of course some profound considerations to follow, and some very big concepts to take on board – like for example the literal existance of supernatural beings. It is a literal leap of faith which many refuse to take. The important thing to realise is that if you’re making the decision because of your inner reasoning and knowing, then it must be right for you. We cannot know with any authority just how deep this goes, but my word is there more to be brought to light yet in terms of our real history on Earth and just who we really are. That is the decision we are faced with now; to embrace the spiritual path – and lawful rebellion was the first step for me. This is far more than getting out of taxes and fines; if you’re stuck at that point and desperate for answers, the right answer is put down the law dictionary and re-think what you’re really trying to achieve. In real world application you then begin to understand why so much of mainstream entertainment, music, money, law and religion all seek to capture and morph the natural, heart-based impulses which attempt to govern our actions. When we all continually accept vast ideological systems devoid of integrity but favouring corruption, devoid of beauty but abundant in obscenity, devoid of purity but favouring lurid behaviour, devoid of peace but full of violent apocalyptic visions, what do we expect to see in the world but exactly that? Accepting all these things as popular entertainment reduces our latent morality – our goodness. We need to restate and affirm our good nature through our words and actions. Then we’ve got to remember who we are and what we’re really doing here. As the inevitable surge of awareness courses through the internet and into mainstream culture, the battle for hearts and minds rages and in 2013 I feel we are being intentionally shaken awake by darker aspects of the controllers’ game. The Woolwich machete beheading, the Sandy Hook Shooting, Aurora Cinema Shooting & the Boston Marathon Bombing are just a few highly conspicous and suspicious events even on cursory investigation, and many have occult connections. They need us to destroy ourselves and they will attempt to destabilise us any way they can; next stop – financial collapse & mass induced scarcity. We must not be destablised and we must not turn on one another. The community or whatever passes as community these days is about to be tested like never before. The upper echelons of my understanding point us right back to our past, and to a hidden knowledge kept from the masses. It’s teachings are of sacred geometry, standing wave energies of the Earth, the planets, the cosmos and it’s cycles, resonant harmonic cavities (churches / temples), crystals, and our etheric energy body. We will eventually re-discover the true relationship between our hearts and the infinite power available to a conscious, spiritually-scientific race. It will take leadership to get us there; just not the leaders we have right now. When these ancient teachings are fully realised and mastered, we will regain our proper status on this planet. We do have dominion. We are the custodians whose minds have been wiped. Our inner knowledge was marginalised and destroyed through collective education in the mundane 5-sense world, our natural cycles were mechanised by calendars and currencies, but finally, we are breaking free. Whilst Lawfulrebellion.org has never concentrated wholly on the religious or the occult, it nevertheless demands attention when so many of todays trends, fashion, music, entertainment and media clearly promote satanism in varying subtle (and not so subtle) ways. I am not an organised-religion kind of man, nor am I against it, but it would appear that world events are played out to a covert religious agenda. To all those that seek insight into the Satanic plan of action, I would recommend Bob Schlenkers’ Open Scroll blog – he is a prolific blogger with formidable insight. I’ve been a follower of the biblical Jesus Christ for a long time, and although you and I would naturally use different language, I believe you’ve hit the nail on the head. The historical “Church”, nominally speaking, is largely to blame for a lot of the ignorance in the world today, but Jesus Himself taught that He brought Heaven with Him to Earth so that all could become children of God and christs. I am confident that the currently-hidden knowledge is not too complicated and not too hidden, a simple case of God covering people with His power (as He always intended to) and Heaven covering Earth. I think we’ll learn the metaphysical components along the way. As for satan, I wouldn’t say he’s completely irrelevant, just that any actual authority or power he once had was taken from Him when Jesus died and rose again. At the point that the Spirit of God entered 120 people 50 days after Jesus died, all authority in Heaven and on Earth was handed back to all who follow Him. So the only power satan and demons have now is over those who believe him, ignorantly or intentionally. As more and more people learn that they don’t have to live a less than perfect life any more, satan and demons will be eradicated from the Earth, and we will inherited a new, perfect world! Wake up to who you are. Excellent article. A good explanation of the attack on our conscience is delivered by searching for Mark Passio. Apparently an Albert Pike said in 1889 “the Masonic religion should be, by all us initiates of the high degrees, maintained in the purity of the Lucifarian doctrine”. And since all corporations are coming under controls of the Order of Freemasons, then we can expect they will be persuing satanic conduct. The utillities, the supermarkets, the banks, all becoming satans little helpers. Wont that be fun? WE ALL must continue with the “Unveiling of the Truth” particularly those with higher levels of awareness lifting up those of lower awareness. The Freemen movement has done a lot to raise awareness of others, myself included. I would like to share my website with you to raise your awareness of the Local Universe, Earth and our Changing Climate. I have just put a new video on the front page of http://ichooseinfinity.com and it describes the tools I have been assembling into patterns to facilitate comprehensive understanding of how our fractal and infinite universe works. Of course not everything is known but there are patterns which transcends the last 100 years of physics that the masses have been taught to believe. Dive into the site for a few days and you will become empowered with infinity and I have made all content available for FREE. It is my gift to all. The Scottish Freemason Douglas Haige became known as the “butcher” because he marched our soldiers infront of German machine guns, and any who refused to go were shot as “cowards”. The first world war was truely hell on earth, which is what the Freemasons want to create. This is the new world order being acted out by foolish politicians with links to Freemasonry, you have to either worship the Devil or they will attempt to kill you, and no one will buy or sell under the new order unless they have the mark of the beast, a five point star, or the number of the beast being 666. This is also the true objective of “socialism” as Moses Mordachai a Freemason, changed his name to “karl Marx” to create state slavery and “Marxism”. The communists have as their symbol a five point star, the mark of the beast. Socialists have a paper called the “morning star” which is the name of Venus, and is also known as “Lucifer”. The book “Rules for Radicals” by Saul Alinsky which “socialists” follow is dedicated to “Lucifere”. One of the founders of the communist Fabian Society Annie Besant was a black wich, the society is involved with forming a world government, for Satan, the arch enemy of the human race. That about sums up my thoughts and observations, sleep well everybody. For tomorrow is another day. 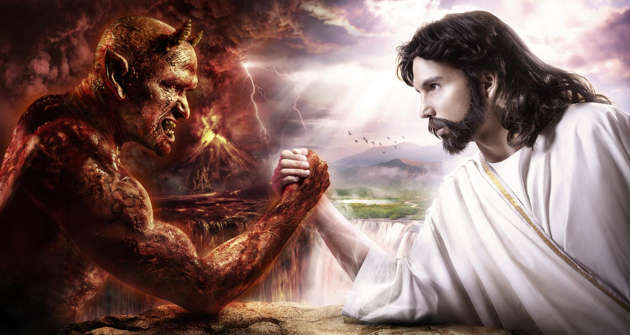 There is a great controversy between Christ and Satan. In 1798 Satan’s main agents on the earth ‘seemed to’ receive a deadly blow. The bible said they’d slowly regain their power and there’d be a time of trouble greater than any before. There is a jesuit pope now. I’d say the wound is healed they’re just waiting for the right time. Freemasonry is controlled by rome. Look at the history of rome, read fox’s book of martyrs. Can a leopard change its spots? Rome has apologised for things but hasn’t changed the teachings which allow it. Note this is not against all catholics, just the institution. Even the so called truth movements are infiltrated and full of esoteric catholic/masonic doctrine. The anonymous symbol is the jesuit Guy Fawkes for example. Alex Jones says the people who say all roads lead to rome are the worst. People on get out of debt free preach babylonian mysticism and pantheism (so called ‘new’ age spiritualism) unknowingly (I hope). Unchanged hearts either hate or try to demote Jesus Christ. They hate the ten commandments. They want to try to build a kingdom on this earth. Jesus said his kingdom is not of this earth. What Andy said. The mark of the beast will be in your hand (your works). The seal of God is in your hand (works) AND your forehead (your mind/heart). See the devil doesn’t care if you believe in his works, just wants to intimidate you into it. I believe the seal of God is the 7th Day Sabbath commandment (worship and rest sunset friday to sunset saturday). The beast wants universal Sunday worship. Pharaoh attacked the Sabbath before the plagues. The Roman Empire attacked the Sabbath too and purged “Judaisers” before it fell. A seal requires a place, a juristiction, subjects etc. The 4th commandment text contains all of this thus is a seal. Albert Pike talked about synthesis. Using hegelian principles. Rub two sides up against eachother. Show the horror of atheism (created by them – the communists were jesuit trained) and offer the Roman Catholic Church (The beast) as the solution. This happened most recently (as far as I know) during world war two in Croatia. Happened to all of Eastern Europe though. Eastern Europe was strongly protestant. Communism turned them all atheists or catholic/orthodox. Synthesis. Good vs. evil is comprised in Natural Law. Ooooook.. Where 2 begin. The devil is the great deceiver. Go back to the first book, Enoch works..
It’s evident, hell is a place on earth untill people wake up, realise the corruption, brainwashing, deception..
People are like fish..schooled at an early age, They swim in 1 straight line,never think out of the box…or swim to a different direction. All the knowledge in the world is free, 1 must look & decode it. Nikola tesla once said, if you can understand the numerology behind numbers 3,6,9 you have unlocked the key to the universe, that genius was not wrong! antichrist murderd him! Are words of saviour…. manga carta … Article 61…. Act now & fast…. Cops wanting id because they don’t know if Sam has done anything – message to all mindless zombie nazi police: What you, the police, don’t understand is that the whole process of checking id for potential warrants or possible history makes the police the bad guys -the criminals. This is because they are checking people against a database that they have no way of verifying if that database is correct. The entire plan for the fascist police state is to soon manipulate the databases by the very criminal politicians and operatives who wish to enslave the people to their ‘authority’. The day is coming very soon where those databases will be totally manipulated with completely false information and the very act of running people’s id in scenarios like this is exactly what will make Sam a target for a hidden hand to simply enter into the database that Sam is a fugitive from justice. In the very near future people like Sam will be arrested and sent to prison as if they have already been convicted in a court even they have never committed a crimeor been to court, simply because a cop believes electronic digits on a screen are correct and thinks he needs to check everyone’s id who he thinks could be suspicious. This is how the actual men and women working as cops will become the nazi ss without even realizing it and will be part of a machine that murders and enslaves their neighbors because they just follow orders – check his papers because he is suspicious, he goes on list in a database as a dissident, next time he gets his papers checked by cops he is arrested because the digits on the cops computer screen says he escaped from prison. No justice, just a total mind manipulation by criminal men to get zombie cops to protect the manipulators crime – a system of concentration camps for anywhere who is aware of the crimes with cops being the nazi thugs.